POLISHED STEEL DESIGN: Superior to regular paint and plastic, this razor features polished steel oxidation, making this razor super durable and scratch-free. This classic Straight Edge Razor is a timeless masterpiece for men’s shaving. 200+ SHAVES: We have packaged our razor with the best selling blades in the market. Included is a box of 100 Single Edge Premium Derbyh Blades which are individually wrapped for safety and hygienic purposes. Each blade can be used for 2-3 shaves, making this Value Pack a great bargain! GUN METAL DESIGN: Superior to regular paint and plastic, this razor features gun metal oxidation, making this razor super durable and scratch-free. This classic Straight Edge Razor is a timeless masterpiece for men’s shaving. PROMAX CARE STEEL RAZOR! You don’t need the “latest and greatest” 3-4-5 blade, super expensive, rolling ball razor out in the market these days, to get a fine quality shave. Our great grandfathers were able to remain handsome and smooth, using this classic Straight Edge Razor which is a timeless masterpiece for men’s shaving. ERGONOMIC DESIGNED;- with comfort and stability in mind, the ProMax Straight Edge Razor performs well and provides the right holding angle to avoid discomfort. When opened, your ring finger rests on the back handle loop, index and middle fingers on top, and your thumb near the blade compartment. PROMAX CARE RAZORS QUALITY: Our razors are made from fine quality Black Handle Stainless Steel, guaranteed to never rust or tarnish with use. Built with an easy-to-open blade guard, you can exchange each blade safely and effortlessly. PROMAX STEEL RAZOR! You don’t need the “latest and greatest” 3-4-5 blade, super expensive, rolling ball razor out in the market these days, to get a fine quality shave. Our great grandfathers were able to remain handsome and smooth, using this classic Straight Edge Razor which is a timeless masterpiece for men’s shaving. PROMAX RAZORS QUALITY: Our razors are made from fine quality Black Handle Stainless Steel, guaranteed to never rust or tarnish with use. Built with an easy-to-open blade guard, you can exchange each blade safely and effortlessly. SHAVES AND SAVINGS: We have packaged our razor with the best selling blades in the market. 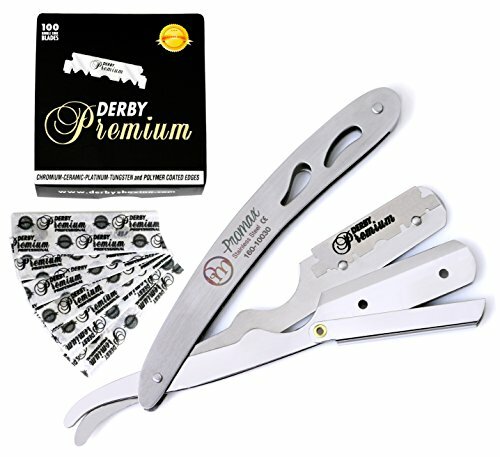 Included is a box of 100 Single Edge Blades by Derby® which are individually wrapped for safety and hygienic purposes. Each blade can be used for 2-3 shaves, making this Value Pack a great bargain! PROMAX RAZORS QUALITY: Our razors are made from fine quality Stainless Steel, guaranteed to never rust or tarnish with use. Built with an easy-to-open blade guard, you can exchange each blade safely and effortlessly. This Double Edged Safety Razor includes 5 Free Derby Premium Double Edge Safety Razor blades to get you started. These blades are Swedish Steel with chromium, ceramic, platinum, tungsten and polymer coated edges considered one of the best choices for classic wet shaving. Greenland Barber & Co. created this 100% metal safety razor for years of use. We designed an eco friendly razor alternative to the endless onslaught of cheap disposable razors. Our luxury razor is designed to produce zero waste without sacrificing a smooth shave for even the most sensitive skin. 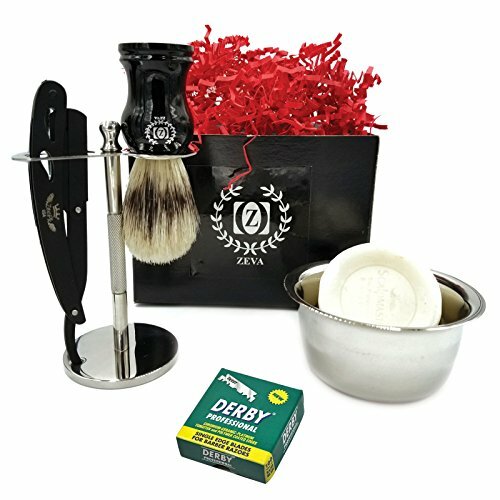 This unique razor comprises a two part, die cast and hand polished, chrome plated zinc alloy head, precision engineered to deliver a shaving angle that is gentle on the skin for a smooth, close, comfortable and accurate wet shave. Our Double Edge Safety Razor is much admired by both beginner and experienced wet shavers worldwide and those who enjoy wet shaving results comparable to an original barber straight single blade razor. Our solid stainless steel handle is also finished with flawless hand polished chrome scratch resistant plating. Add our double edge safety razor to your wet shave kit at home, or pack it in your to go kit as it makes an ideal travel razor. High Quality Materials: Heavy duty stainless steel handle, and zinc alloy head finished in chrome harmonizing durability, performance, and old school style. Precision Design: The handle was carefully proportioned to the head creating perfect weight distribution for increased comfort, and control. Our mission is creating an effortlessly smooth wet shave every time for a lifetime. Vintage Eco: Uniquely embossed head inserted in an hour glass curved shaft constructed of old fashioned natural materials satisfies the traditional classic gentleman who remains in fashion for a lifetime. 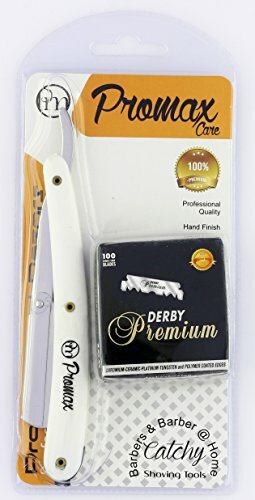 Derby Premium DE Razor Blades Included: World Renown Swedish Steel Derby Premium Double Sided Blades (five pack) included allowing instant professional shaving kit right out of the box. 100% Fully Guaranteed: If you are not satisfied with our razors contact us directly. We stand behind our products and believe in customer relationships and are committed to give the best customer service possible. Cut throat shave the way with this replaceable blade shavette. The shavette is a close relative to the straight razor with the difference being that the blades can be changed, just like a safety razor. This means you don’t have to worry about stropping and sharpening yet enjoy the closeness of a straight razor shave. 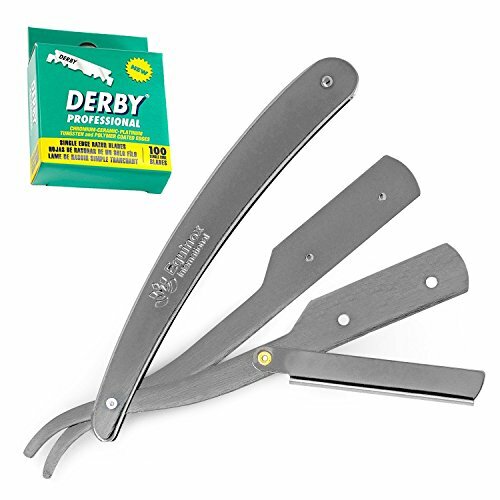 This shavette uses standard safety double edge razor blades like Derby, Gillette 7 o’clock, Astra Superior etc. which are readily available in most supermarkets as well as online – a quick and simple process. ★ Open the top hinged cover of the Shavette until it is pulled back completely. ★ Split the blade holder so that the Shavette is now fanned out into 3 parts. 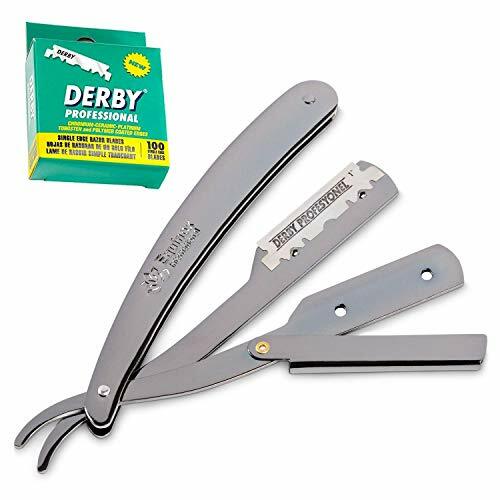 WHICH BLADES NEED TO BUY: This shavette uses half of a double-edge razor blade so you can buy any standard double edge razor blades like (Derby, Astra, Gillette 7 O’ clock etc) which are readily available in most supermarkets as well as online. For blade installation please see below in the description. 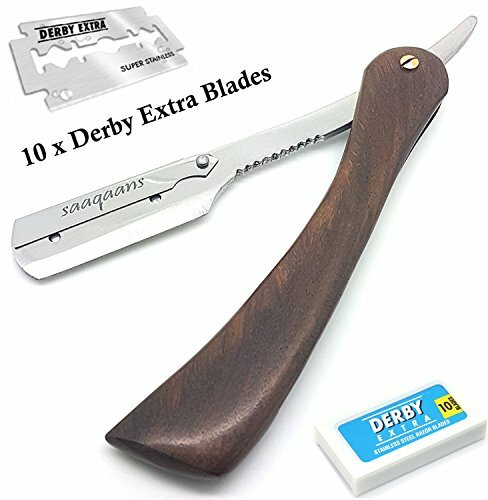 WHAT’S INCLUDED IN THE PACKAGE: You will get one branded straight edge shavette razor with 10 x Extra double edge razor blades in a beautiful pouch with a manual instructions included in the package PLUS you will get FULL 30 DAYS MONEY BACK GUARANTEE in case if you are not satisfied with the product. EXPERIENCE- The most classic shave with our double edge safety razor ! 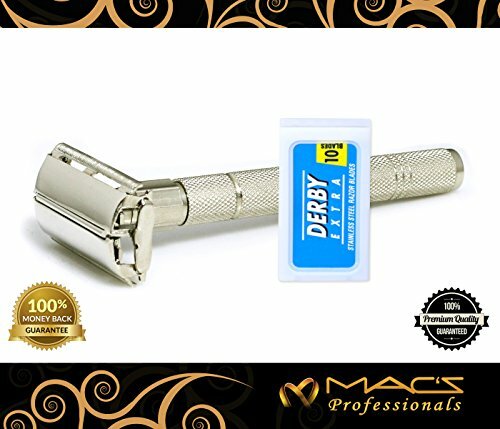 Solid, Vigorous and utterly manly, The double edge safety razor-The ultimate razor for that perfect morning shave through stubble like never before with this robust, Classic and precision -engineered piece of genius -The Macs Professional Heavy Chrome Plated Razor is Specifically designed to give ultimate quickly shave each time at every stroke, They are a must -have for professional Barbers ,and delivers sleek effortless results-Brush to make your hair smooth with 20 Derby Blades will help lost through many shaves-Ideal for the Barbershops or home or bathroom ,These Blades are manufactured with high quality stainless steel for durability and longevity, 100 % Brass with chrome plating rust -resistant &Durable .Include brush and 10 Derby Double Edge Blades Perfect for a Safe , Close Shave every time, How to Change Blades -To Change Blade s Hold the cutting head by the side s with one hand while unscrewing it from the handle ,Once the handle has been removed ,Lift the bottom plate by pinching the corners to avoid edge of the blades. tilt you fingers allowing the use blade to fall out and drop a new blade on to top of the cutting head ,Place the new Blade and tighten the handle to securely assemble the Razor Again, Comes in a beauty full black Box which is Perfect for Gifts with 100% Satisfaction Guarantee . 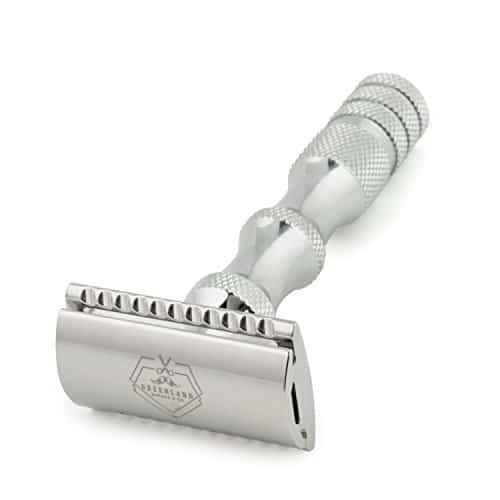 Features of Our GoBetter Double-Edge Safety Razor Include: • Chrome plated, has a nice finish. • Solid weight, quite sturdy • Textured handle gives it a good grip • Twist to open butterfly doors, ease of changing blades. 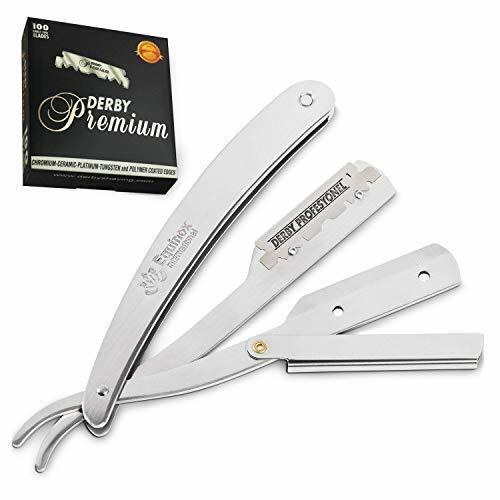 • Comes with 5 super stainless steel blades and shaving immediately • No irritation, good for sensitive skin • Good weight & design, well balanced • Provides a close shave. • Easy to clean. SAFETY RAZOR COMPLETE KIT-This is a very attractive double-edge safety razor. It has a Butterfly-Style opening head for a QUICK blade change. The textured design will not only give it a nice look but also help you to get a nice grip even with wet hands. GOOD PERFORMANCE – Its considerable weight easily provides a close, clean shave without using extra pressure to your face. This razor leaves your face feeling great after a shave with no stinging, bumps, or razor burns. The features of GoBetter butterfly razor make it an equally good safety razor for women too. Much sharper and more efficient than your usual girly razors. Many people love the idea of “cut-throat” straight razor, but they don’t love the honing and maintaince needed to keep it in that way. The shavette razor allows you the best of both worlds. You can get the closeness and feedback that you get with a long, sharp blade, but you don’t have the maintenance when you can simply switch out the blades with a new, fresh edge. Also, great for barbers who need a new, sanitary blade with each client. Step 2: Separate the two metal sections of the razor. Step 3: Skip to part 4 if your blade is already in half like Derby. If your razor blade is Double Edge like Dorco Feather Personna then Break in half the blade like shown in the picture. Step 4: Fit the blade over the two raised bumps on the lower metal section. Step 5: Then place the higher metal section on top and squeeze together. Step6: Step 5: Close the catch over the two metal sections. Your straight razor is now ready for use. Prepare to enjoy your closest and most satisfying shave yet.. Preparation is very important. Your beard and skin must be softened and ready. Use hot towel for 30 seconds to open up your skin pores. Then work the shaving soap up to a rich latherand apply with your Zeva Shaving brush, using a circular motion to make the hairs stand up ready for shaving. Stretching the skin with your free hand, use the other to move the Shavette in short strokes in the direction that the hair grows.Hold the Shavette at a 30degree angle to the skin – that way it cuts the whiskers and avoids cutting you! After you are done shaving apply cold water to close your skin pores.